In response to the deterioration of the health of the Indian River Lagoon (IRL) along Florida’s east coast, Brevard County residents approved a sales tax referendum in 2016 to fund the Save our Indian River Lagoon Project Plan for ten years. The plan focuses on reducing nutrient inputs to the lagoon through stormwater and wastewater retrofit projects as well as fertilizer education and restoration efforts. 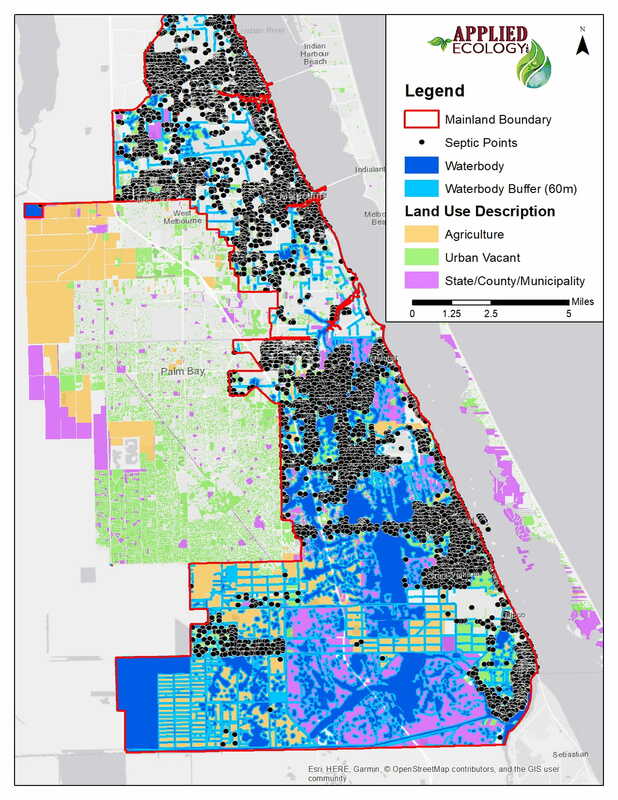 To reduce new sources of groundwater pollution, Brevard County Commissioners recently adopted a temporary ordinance limiting new conventional septic systems within 50-meters of the IRL, connected tributaries, and surrounding barrier islands. This critical distance was selected based on a few available studies in the South Indian River Lagoon watershed. To produce a permanent ordinance that balances protection of water quality with other socio-economic factors, further analysis was needed to better understand which areas of the county are contributing the most septic pollution to the IRL. This information will be also used to prioritize sewer service expansion areas. To begin, Brevard Count was divided into four regions: Merritt Island, the Barrier Island, the Melbourne Tillman Water Control District (MTWCD), and the remaining areas of Mainland Brevard. Regions of interest within the Brevard County TMDL Boundary. 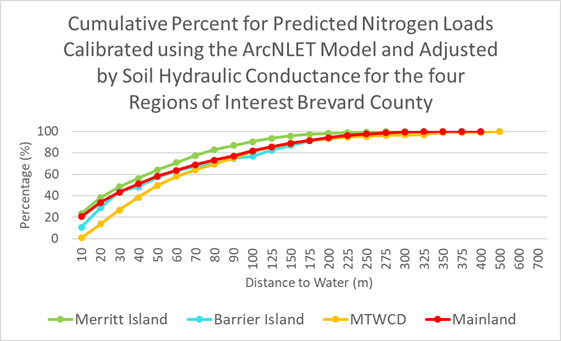 An extensive predictive modeling effort with site-specific information for the watershed was undertaken to determine the minimum buffer required to effectively protect the IRL from nitrogen loads from septic systems. The simplified conceptual model of groundwater flow and transport, ArcGIS-based Nitrate Load Estimation Toolkit (ArcNLET), developed by Ye and Rios for the FDEP was customized with County-based input data to produce estimated ammonia and nitrate loads. ArcNLET is the current accepted model used for BMAP stakeholders to receive credit for removing individual septic tanks in an impaired watershed. Nitrate plumes and associated distances to water for individual septic tanks modeled. 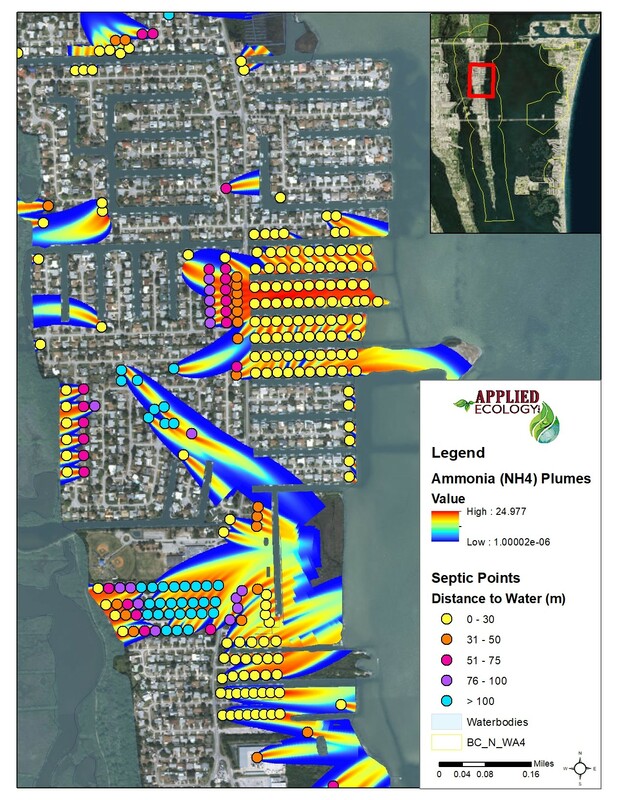 Predicted nitrate and ammonia plumes impacting the Lagoon from individual septic tanks were simulated based on a variety of variables: distance to the Lagoon or connected waterways to the Lagoon, soil hydrologic grouping, floodplain category, and elevation above sea level. Predicted loads by distance group (e.g. septic tanks between 0-30 meters, 30-50 m, 50-60m, etc.) were statistically and graphically represented to inform critical distances of protection. In addition, Monte Carlo simulations (multi-variate statistical analysis) of hundreds of septic points explore how other variables, such as soil type, might impact the critical protective distance. The presentation describes the methodology and provides results from this large simulation effort and how the results can be applied to fine tune policy decisions. 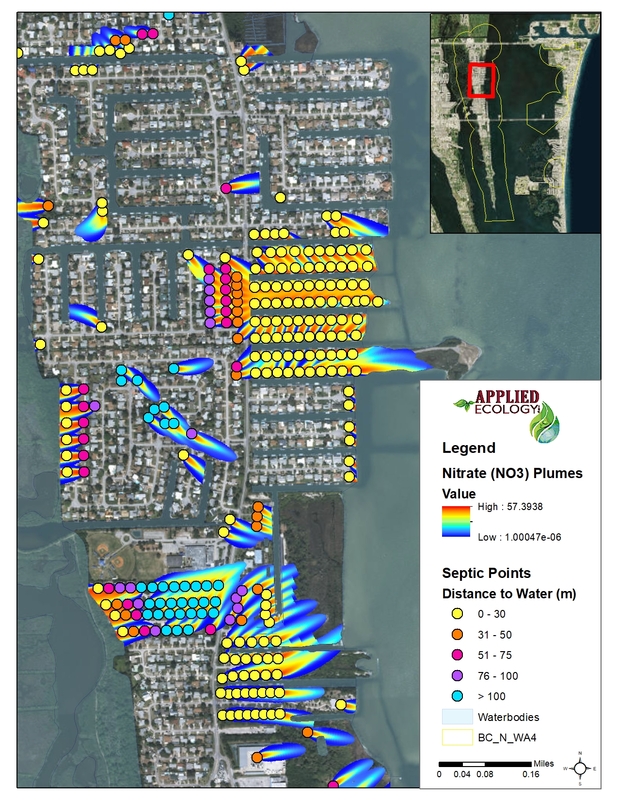 Predicted nitrate and ammonia plumes impacting the Lagoon from individual septic tanks were simulated based on a variety of variables: distance to the Lagoon or connected waterways to the Lagoon, soil hydrologic grouping, floodplain category, and elevation above sea level. Predicted loads by distance group (e.g. septic tanks between 0-30 m, 30-50 m, 50-60 m, etc.) were statistically and graphically represented to inform critical distances of protection. In addition, Monte Carlo simulations (multi-variate statistical analysis) of hundreds of septic points explore how other variables, such as soil type, might impact the critical protective distance. 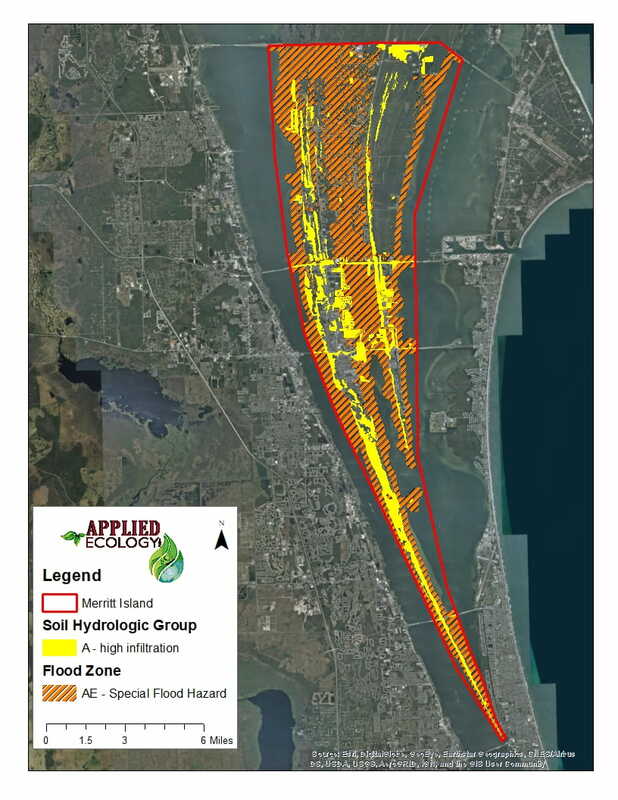 Ultimately Applied Ecology, with guidance from the Brevard County Natural Resources Department, was able to determine the critical protective distances for each of the four regions. Results show that all distances from the water are critical for both Merritt Island and the Barrier Island, thus, all areas within these regions but be protected from further septic tank installations. 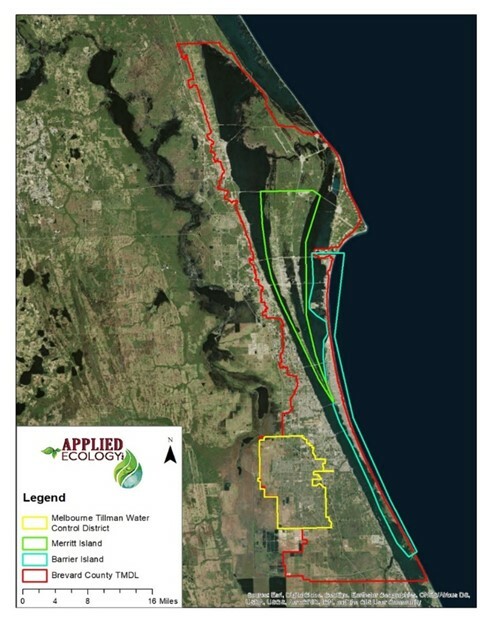 Within the MTWCD, a protective distance of 50-m within a connected waterbody was established, while the remaining areas of Mainland Brevard were protected with a 40-m boundary. The results from this large simulation effort demonstrate how predictive modeling can be applied to fine tune policy decisions.